I want to start collecting information on X-Trap and the various error codes and solutions. We're apparently getting a few tickets on X-Trap per week and I think it's a good idea to collect and put all of this information into one thread for easy reference. Hopefully this will lighten the support team's load on the number of X-Trap tickets they receive. I think this is quite necessary because X-Trap is not developed by Suba Games. This makes us regular users of X-Trap just like all of you. Granted the support team may be a little more knowledgeable than the average user on X-Trap issues, but it's good to have a collective list of problems and solutions with input from a wide variety of users under a wide variety of operating systems. This listing will grow over time(hopefully) from it's humble beginnings, and I'm asking you guys to roam around the X-Trap threads on our forums and reply with a link to the particular thread that contains a problem that has not yet been addressed in this list. If you know of an X-Trap problem and of a solution to it, please post it here as well. If you think an existing solution should be modified or refined a bit more, please post it here as well. We want to be as thorough and detailed as possible(without writing a novel on each solution =p). This is not the place to ask for help with X-Trap. Please start a new thread if X-Trap is giving you trouble. We want to keep this thread uncluttered. It will get confusing if three different people have three different X-Trap problems and we have another three people trying to help. One thread, one problem, easy. 1. Make sure that Priston Tale and X-Trap are not being blocked by any and all anti-virus programs and firewalls that you have running, and if they are, add them to the exception list for each anti-virus program and/or firewall that you have. Searching Google with the name of your anti-virus/firewall software and exception list should come up with how to achieve this if you are unsure. As a last resort, disable your anti-virus/firewall programs temporarily and then let X-Trap attempt to update itself again. If it updates and you can connect to Priston Tale successfully, then you know the cause of the error is your anti-virus/firewall programs. You can narrow the problem down even further by disabling just one of those programs if you have both or multiple anti-virus or firewall programs to see which one specifically is conflicting with X-Trap and Priston Tale. 1. Run Priston Tale as Administrator. Priston Tale and X-Trap cannot update themselves properly without administrative privileges. 1. Run Priston Tale from an XP user that has administrative access. If you are on an XP user that does not have administrative access(such as a guest account), make sure that Priston Tale and/or X-Trap have full administrative control for the XP user that you are using. This must be set by an XP user with administrative access. X-Trap is missing XPva00.dll xxpva01dll or xpvadll02.dll. 1. Navigate to the root folder of Priston Tale(for most people this is C:\Program Files\Subagames\Pristontale or whatever your hard drive letter is). Make a copy of ptReg.rgx in case you mess up. Open the original ptReg.rgx with notepad and make sure the first line reads: "Version" "3131"
If 3131 is not the latest version of Priston Tale, then change the number to the version of Priston Tale that is currently live. If you're unsure, you can find this information on our Priston Tale 1 website at http://pt1.subagames.com/download.aspx and look for the latest number. If this solution does not work for you, delete your edited ptReg.rgx file and rename your backup "ptReg.rgx" to restore the original. 2. Make sure that Priston Tale and X-Trap are not being blocked by any and all anti-virus programs and firewalls that you have running, and if they are, add them to the exception list for each anti-virus program and/or firewall that you have. Searching Google with the name of your anti-virus/firewall software and exception list should come up with how to achieve this if you are unsure. As a last resort, disable your anti-virus/firewall programs temporarily and then let X-Trap attempt to update itself. If it updates and you can connect to Priston Tale successfully, then you know the cause of the error is your anti-virus/firewall programs. You can narrow the problem down even further by disabling just one of those programs if you have both or multiple anti-virus or firewall programs to see which one specifically is conflicting with X-Trap and Priston Tale. X-Trap shows up as a trojan/virus from your anti-virus software. 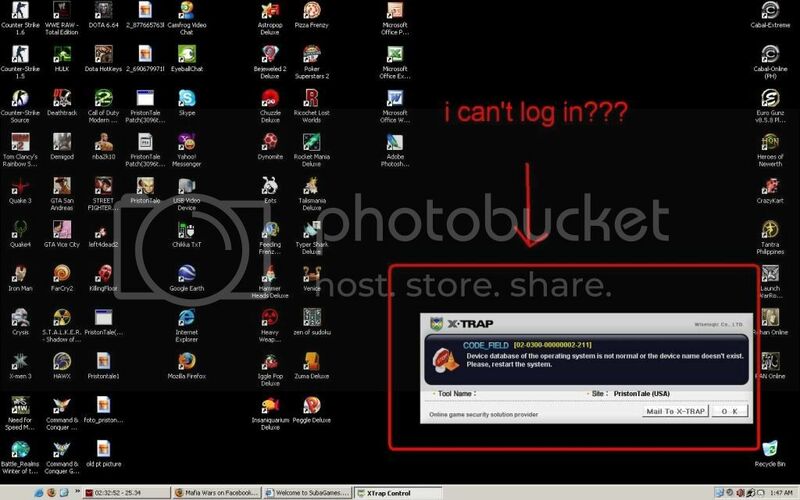 X-Trap is not a virus and does not contain any viruses. You are getting this message because of the way X-Trap behaves. Some virus scanners pick up packet sniffing activity and program hooking and other things that X-Trap does as viral activity if it's coming from a program that isn't widely used or well known enough to be defined internally by the anti-virus software(excuse my lingo if I'm not using the right terms). We assure you that there are no viruses contained in X-Trap. If you are getting this message from your anti-virus software, you must add X-Trap to your anti-virus software's exception list, and that lets your anti-virus software know that X-Trap is not a virus regardless of what it's doing on your machine. This is software specific, and looking it up on Google will likely get you a tutorial on how to do this if you are unsure. In my opinion, the XTrap problems exist because of compatibility issue between the AntiVirus Program and the XTrap update. I encountered one of the case stated in my thread titled Solving [My] Xtrap Problem which is not from your list. I am playing this game in 2 seperate computers and one always encounter the problems stated in my thread and the other dont have any problem at all. Both computers are running on the same OS but different Anti Virus Program. The one that gives me problems had Norton Anti Virus installed and the other AVG installed. Both computers are running fine with the game before the XTraps updates but problems start to surface after the updates. What I am trying to bring across, is there might be different conflicts caused by different AntiVirus Programs which results in many different problems. So to isolate the problem we should start by asking the user to play the game with the Anti Virus Program disable first. Well it might not be the best methods yet but it do help me to determine what is the actual cause. Suggestion added to the anti-virus/firewall portions and will continue to be added where applicable. Thanks. For me, turning off the virusscanner eventually helped me. the rest that sais the topic didn't help me, but i tried it all. go to computer and files. and turn of virus scanner. this helped for me, but if you turn that off, mcafee will say your computer is not protected . because i dont really care about that, i just turn it of everytime i want to play. if you dont turn it of, mcafee sees xtrap as a trojan horse (what it probably isn't). thats why it doesn't work. Last edited by hangbuikzwijn; January 13th, 2010 at 02:37 AM. and download it mannually I suggest. I dont know where you can download XTRAP, maybe u can google it? X-Trap Error Code 02-0400-00000000-200: Game cannot properly due to alteration of game client, close any progeam which is affecting game client and restart the system. Solution => Unable the service : "AMD PowerNow! (tm) Technology Service"
Last edited by Comunux; April 8th, 2010 at 02:48 AM.